"Are you really concerned about the dead, Senator? Are you really pro-women? Because right now, all I see is that you are pro-Delima". Trixie Cruz-Angeles, a lawyer who graduated from UP wrote an open letter to Senator Leila de Lima on her Facebook page claiming the latter of using human rights and rights of women in order to oust President Rodrigo Duterte. Atty. 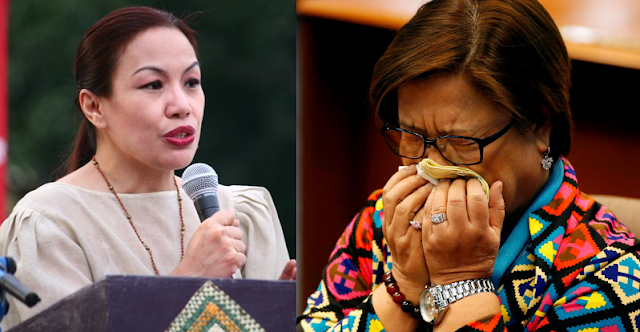 Trixie said that she did not feel compelled to defend the president but felt that she should defend the country from a senator's "ill-disguised attempt to oust a duly elected leader,"
She said De Lima herself disobeyed the decision of the Supreme Court when she was Secretary of Justice and was not above the Aquino naming and shaming campaign either. She said while De Lima sat as Secretary of Justice, women were trafficked into Bilibid and the inmates' families would complain. Women according to Cruz-Angeles were treated like commodities. "You do human rights and rights of women a disservice." she said. "You have made these principles hostage in your attempts to stave off incipient criminal cases. You have made them strategic initiatives." she wrote. The post has earned 2.7 thousand likes as of writing.